Using the Alderney Ring is simple and safe as long as you set it up and use it correctly, and pay attention at all times. Some people try the method and it has not worked for them initially. Here are a few reasons why you may have problems until the Alderney Ring is set up properly. Are you using rope and just a few metres of chain? If so, you need a larger buoy. Are you using a lot of chain? The method only works well for anchoring with rope and a few metres of chain. You need to swing wide at the start of the retrieval to run in parallel to the original anchoring line, and keep to that track. Watch for cross-winds which create wave patterns that make it easy to accidentally steer back over the rope. If in doubt, steer much wider than necessary. You are travelling too slowly. 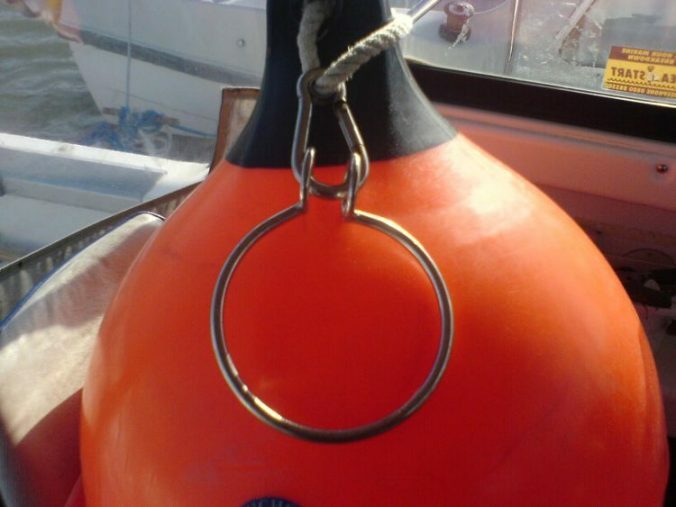 You need to travel at sufficient speed to create drag on the buoy, it needs to have a foaming “bow wave” in front of it to help push it down the rope. The ring is too small or is uneven. You need a wide, smooth and rigid ring of about 15cms diameter that runs easily down the rope and along the chain. Test this on dry land first. You have too much chain or the anchor is too heavy for the speed you are travelling. The anchor rope must stream out nearly horizontally behind you otherwise there will be a kink in the rope that the ring will never travel past. See the diagrams below. Figure A shows too much chain, the anchor is dangling down and the buoy will stick at a point along the rope caused by the angle of the rope. 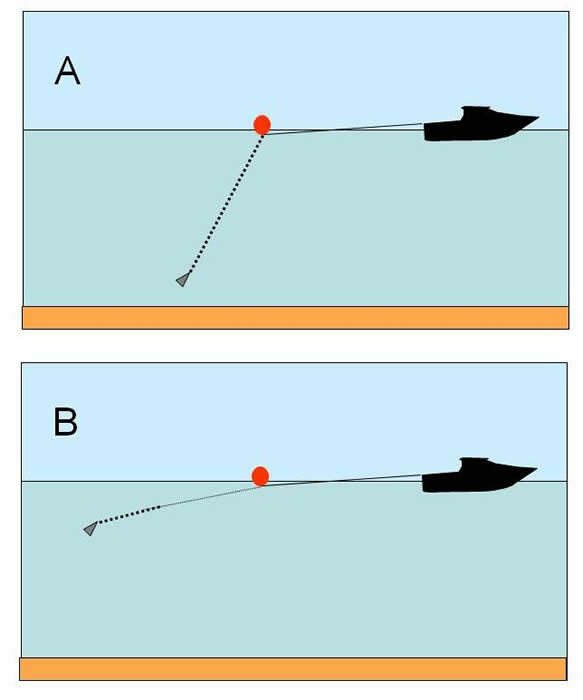 Figure B shows a lighter set-up, where the buoy slips easily along the rope.